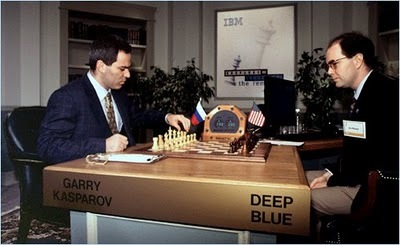 Did a mysterious rook move by Deep Blue cause Garry Kasparov to lose his match against the computer? Review of "Brooklyn Castle" in "NY Post"
The documentary film Brooklyn Castle is reviewed in the New York Post. 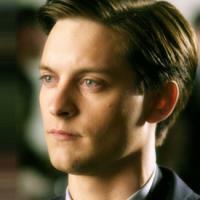 Lionsgate International will begin shopping Pawn Sacrifice, starring Tobey Maguire [pictured] as Bobby Fischer, to foreign buyers. Yesterday morning, in the class at Caldwell College conducted by Columbia Academy, the students handed in their homework assignments. Everyone solved the chess problem correctly. Next I presented, at the demonstration board, a game between Tigran Petrosian and Bobby Fischer where Fischer as Black played the King's Indian Defense (KID). Fischer allowed Petrosian's pawns to occupy the center squares, only to immobilize and attack the pawns. Think of the center squares as a bridge. The two armies fight for control of the bridge. The army that gains control of the bridge can invade into enemy territory. In the KID, Black lets the white pawns occupy the bridge but does not allow the pawns to cross the bridge. Fischer's pawns attacked Petrosian's pawns on e4, d5, and c4 from the f5, c6, and b5 squares respectively. Then I began teaching simple endgames. In king and pawn endings, having the opposition is the difference between a win and a draw. The defending player's king must oppose the attacking player's king to keep it away from the queening square. In rook and pawn endings, the defending player should aim for the Philidor drawing position with king in front of the pawn and rook guarding the defender's third rank. Finally I showed checkmates involving king and queen versus king, king and rook versus king, king and two bishops versus king, and king and bishop and knight versus king. The winning technique is always the same: drive the enemy king into the corner. The ending of king and two knights versus king is not a forced win, if the defender keeps his king away from the corner. When driving the king into the corner, beware of stalemates. Make sure that the king has at least one legal move. Next class, I will discuss endgames that are more complicated. Last night, the Marshall Chess Club sent an e-mail advising that the lecture by FM Brian Hulse, scheduled for October 30th, has been "canceled and postponed to another date to be announced due to Hurricane Sandy which is expected to peak in the NYC area on Tuesday." A lecture by FIDE master Brian Hulse. 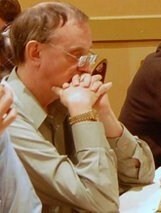 USCF life master Brian Hulse has been a fixture on the U.S. chess circuit for five decades. A highly successful tournament player (Brian won the Marshall Chess Club championship in 1978), sought after coach, and brilliant lecturer, Brian will present a review of the psychological approach to chess, from Reuben Fine versus the Soviet school of chess to present day. Is chess a disease, a job, or something else? A game, perhaps? We will discuss the problem of thinking about how we think about chess. 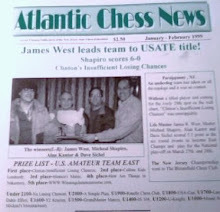 In week eight of the United States Chess League, the match between the Baltimore Kingfishers and the New Jersey Knockouts was a rare bird. Black won every game on boards one, two, three, and four! "Time" Review of "Brooklyn Castle"
Kayla Webley reviews Brooklyn Castle. 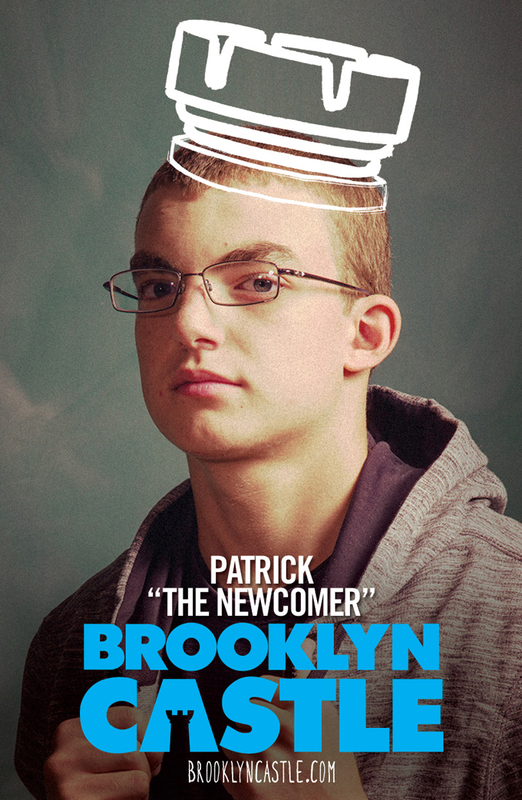 Marty Markowitz approves this movie. On Sunday, I drew this game at the Marshall Chess Club in the team tournament. 30.Rf2 Rh1+ 31.Kc2 Ra1 32.Rg2 Kd7 33.Rg1 Rxa4 34.Rh1 Ke7 35.Kb1 Kf7 36.Rh8 Bf8 37.g5 fxg5 38.Bxg5 b5 39.Bd2 b4 40.Rh5 b3 41.Rf5+ Ke8 42.d5 cxd5 43.Rxd5 Be7 44.Bg5, draw. 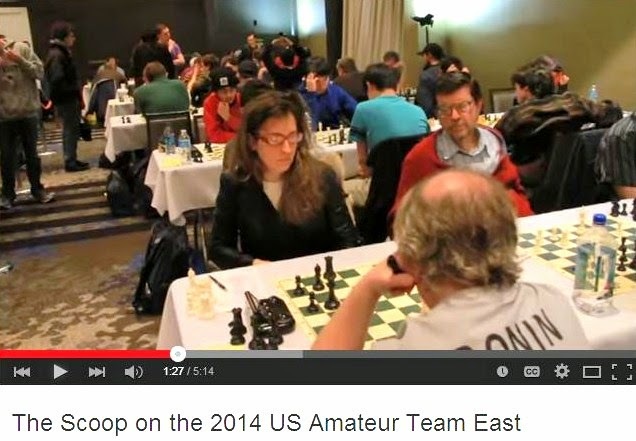 The team, of myself on board one and Ed Kopiecki on board two, called ourselves Occupy West 10th Street at the Marshall Chess Club Amateur Team Championship this past weekend. We won the tournament with a score of 3-0-1. 28.Rxb5 axb5 29.Rc1 Rd3 30.Kf2 Ra3 31.Rc7 Bb4 32.Rxb7 Rxa5 33.Kf3 Bc3 34.Kg4 b4 35.Kf5 Kh7 36.g4 Ra6 37.g5 Kg8 38.Rb8+ Kh7 39.Bb6 g6+ 40.Kf6 Bd4 41.Rb7+, draw. In yesterday's class, conducted by Columbia Academy, students handed in their homework assignment which was to solve a mate in two for White. All worksheets were correct, except that two students forgot to write + for check and # for checkmate in their algebraic notation. Continuing with my teaching of middlegame strategy, at the demonstration board I showed a game between grandmasters Nigel Short and Garry Kasparov from their world championship match in 1993. White's strategy was to create what chess players refer to as "a square" - a center of operations for his pieces. First the white bishop, then the white knights, and finally the white rook all occupied the d5 square. Students should think of such a square like Room 107 in Aquinas Hall at Caldwell College where we have our chess class on Saturday mornings. All of us go to Room 107 in the same way that Nigel Short's pieces went to d5. Then I analyzed a couple of games that were played last week by the students. The class concluded with a practical session during which new games were played and adjourned at 10 o'clock, to be resumed next week after I present another example of middlegame strategy. A lecture by FIDE master Nathan Resika. FIDE master Nathan Resika played his first tournament at age 24, became a USCF master at 31, and FIDE master (official FIDE rating 2315) at age 40. A winner of numerous tournaments both in the U.S. and Europe and with wins over many grandmasters and international masters on his resume, Nathan will present and analyze some of his most interesting games and share his secrets of mastering chess without the advantage of starting young. 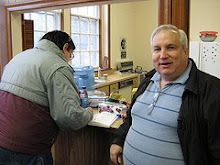 Nathan teaches chess in the New York City area and is also a professional opera singer. 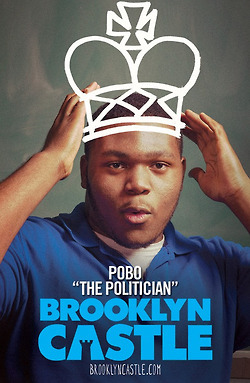 Watch a clip from the documentary film Brooklyn Castle which opens today in theaters. In week seven of the U.S. Chess League, the New Jersey Knockouts took a page from football's book, twice using the draw play against the Boston Blitz to tie their match. View the game film on boards one, two, three, and four! On Monday evening, I tried a new move 19...Rxh2 against Ed Kopiecki at the Marshall Chess Club, in the final round of the FIDE Mondays tournament. In three previous games against the same opponent, I played 19...Nd7 20.Qxb6 Nxb6 and lost the endgame each time. 38.Kc2 Rh8 39.Rxh8 Bxh8 40.Kb3 Bd4 41.a4 Kd7 42.Kb4 Kc6 43.a5 Be3 44.a6 Kb6, White resigns. 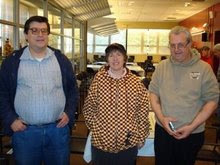 On Sunday, I finished with a score of 2-1-1 in the under 2300 tournament at the Marshall Chess Club. 56.Rb3 Rc7 57.Kf4 Rc4+ 58.Ke3 Rxa4 59.Kd3 Ra2 60.Kc3 Kc5 61.Rb2 Ra1 62.Kc2 Rh1 63.Rb8 a4 64.Kb2, draw. 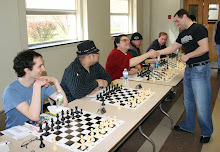 On Saturday, I won this game at the Marshall Chess Club in the under 2300 tournament. 17.exd5 Bxa3 18.Rxa3 b4 19.Nc4 Qc5 20.dxc6 Nb6 21.Nxb6 Qxb6 22.Ra1 Qd4 23.Qe3 Rad8 24.Qxd4 Rxd4 25.Rfe1 Kf8 26.Rac1 Nd5 27.Bxd5 Rxd5 28.Re4 f6 29.Rc4 Rc8 30.c3 bxc3 31.R1xc3 Ke7 32.Kf1 Kd6 33.c7, Black resigns. 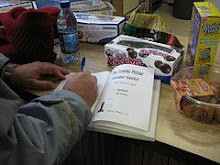 In yesterday morning's chess class, conducted by Columbia Academy at Caldwell College, I taught the students how to keep score using algebraic notation. I also showed the symbols used in chess notation for equal, White is better, Black is better, check, checkmate, good move, bad move, winning move, losing move, risky move, and dubious move. Then I discussed strategy, which is another word for planning. 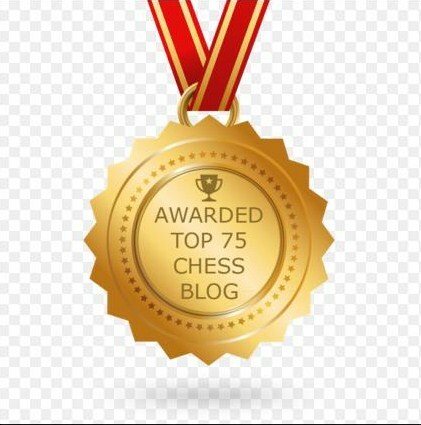 Because there are more possible moves in a game of chess than there are atoms in the universe, the human brain can not cope with such a high number. Playing an intelligent game of chess becomes impossible for us. 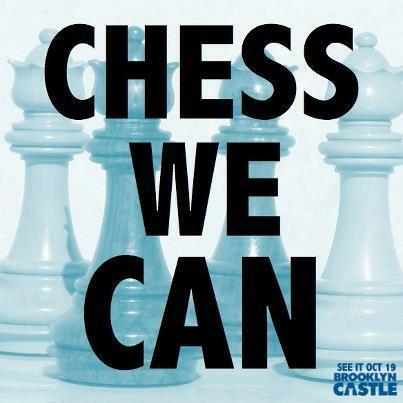 But if we have a plan and follow it, chess is not only possible for us, it can be simple. To illustrate one strategy out of dozens, at the demonstration board I presented a game by Anatoly Karpov as White where Karpov's simple strategy was to obtain a better king bishop than his opponent's queen bishop, because Karpov's bishop actively controlled the long diagonal while his opponent's bishop was passively placed. For the last half hour, the students played chess while keeping score. Next class, the students will bring their scoresheets. I will analyze their games at the demonstration board. By a resolution of the 112th Congress, today is National Chess Day. Preview Screening of "Brooklyn Castle"
Click here to buy tickets to a preview screening of the documentary film Brooklyn Castle. 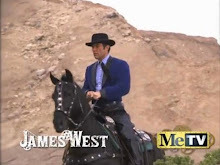 View this update from producer Nelson Dellamaggiore, asking for your support. In week six of the USCL, the Saint Louis Arch Bishops had these words for the New Jersey Knockouts: "Show me!" The Knockouts drew the game on board one. But the Bishops were too strong on boards two, three, and four. Matthew Lillard says support Brooklyn Castle. 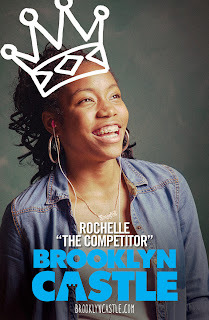 Help us fund screenings of Brooklyn Castle for the communities, schools, parents, and kids affected by after school programs! It's finally here!!!!! After many long hours of filming, editing, and appearances at countless film festivals (including our debut at SXSW this past March), Brooklyn Castle is now coming to theaters nationwide starting this October 19th!! It has been an absolutely incredible journey so far, and we owe a huge debt of gratitude to the Kickstarter community for helping fund our early creative vision and then turning it into reality. That's why we're turning to you again! We need your support more than ever, now that we're coming to theaters. •Rental of movie theaters/screening locations for special community screening events in cities across the U.S.
•Transportation to get viewers to the screening, shipping costs for prints and travel costs, so the filmmakers and Brooklyn Castle's subjects can attend. In addition to helping fund a larger rollout of the film to communities across the U.S. that might not otherwise see it, your funding support also plays another role - spreading the word. 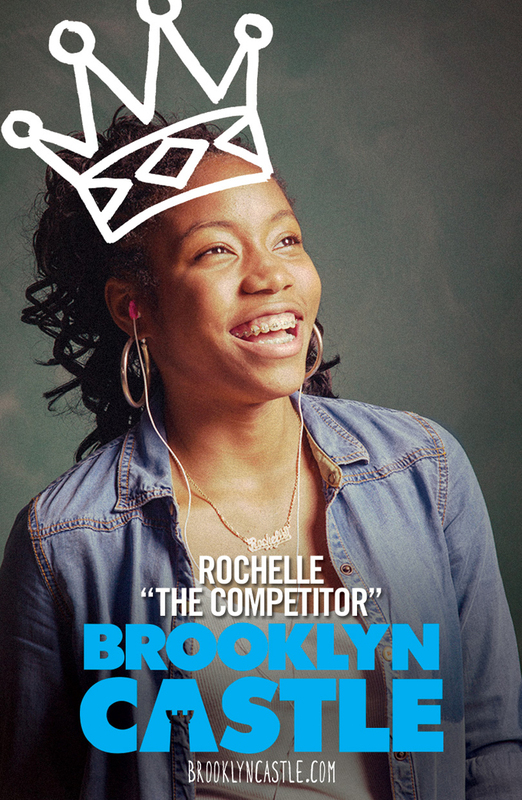 Through regular campaign updates that we plan to distribute to Kickstarter supporters, we hope to find partners and supporters across the U.S. who not only care about the critical issues of after school programs in their communities, but who can help us spread the word so that as many people see Brooklyn Castle as possible. Join us! Go see Brooklyn Castle on 10/19 and, in the meantime, donate whatever you can afford to make sure the film gets seen by as many people as possible. Whatever the amount, please know that your support will play a critical role in helping us spread the word about this amazing film to the people that need to see it. To learn more about the project and join our update list, please visit www.brooklyncastle.com. In theaters October 19, 2012. 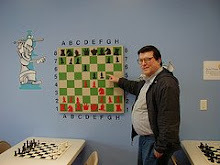 On Sunday, this game was played at the Marshall Chess Club. 14.bxc6 bxc6 15.h3 c5 16.Rfb1 Nb6 17.Rd1 cxd4 18.Nxd4 Bc5 19.Nxf5 exf5 20.Qxd8 Raxd8 21.Be5 Ne4 22.Nxe4 fxe4 23.a4 Rxd1+ 24.Rxd1 Nxa4 25.Ra1 Re8 26.Bxg7 Kxg7, draw. 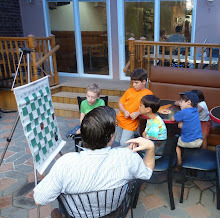 On Saturday, I drew this game at the Marshall Chess Club. 33.R1a5 Kg7 34.Rc5 Nxc5 35.Rxc7+ Nd7 36.c4 Kf6 37.Rc6+ Ke5 38.Rxh6 Nf6 39.g3, draw. 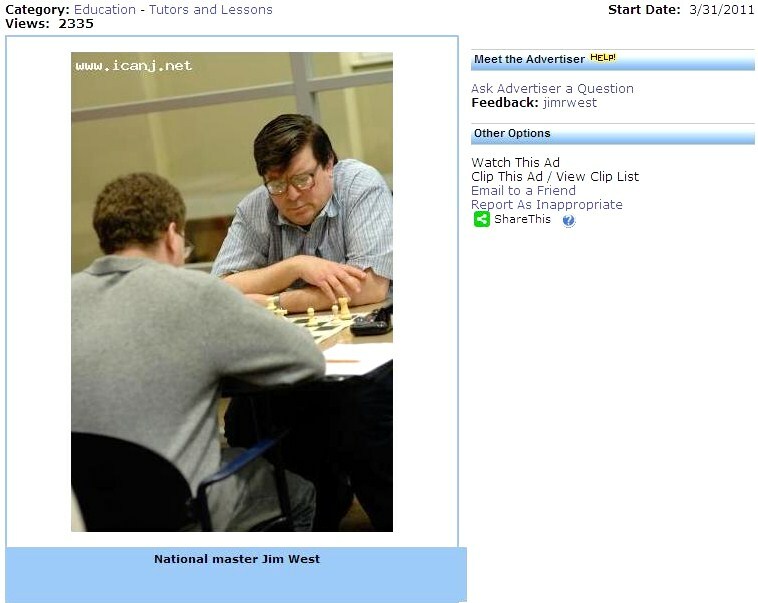 Here are recaps of my Saturday morning chess class, conducted by Columbia Academy, at Caldwell College. In the September 22nd class, I explained how each piece moves and gave the value of each piece. A pawn is worth 1, a knight 3, a bishop 3 and a quarter, a rook 5, and a queen 9. The king is priceless. Those are the piece values at the start of the game. Your goal, as the game develops, is to increase the value of your own pieces, while at the same time decreasing the value of your opponent's pieces. The name for this process is positional chess. I also discussed tactics and strategy. Tactics are the weapons that you use to carry out your strategy. Planning ahead is strategy. On the demonstration board, I showed two games: the first by Paul Morphy as Black, illustrating tactics; the second by Bobby Fischer as White, illustrating strategy. In the September 29th class, I taught the King's Indian Attack for White and the King's Indian Defense for Black. At the demonstration board, I showed a game won by Bobby Fischer, using the King's Indian Attack and finishing with a brilliant queen sacrifice. Next Saturday, I will start teaching how to play the middlegame, now that students know how to make it past the opening without any disadvantage. If chess is a war game, then the middlegame is when the fighting takes place, usually near the center of the board. To play the middlegame successfully, a player must combine tactics with strategy. I will give examples of tactics involving pins, forks, double attacks, discovered checks, and more. In a future class, I will focus on strategic planning in the middlegame. The topic for the October 6th class was tactics, which are the weapons that you use to carry out your strategy. These include pins, forks, skewers, double attacks, and discovered checks. At the demonstration board, I showed a combination by Mikhail Tal involving three different tactics: double attack by the queen, pin by the rook, and fork by the knight. I pointed out how Tal's pieces cooperated with each other in this winning combination. 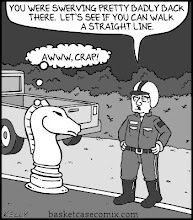 Piece coordination is important in chess. In the next class, I will focus on strategy, which is planning for the future. Garry Kasparov and Magnus Carlsen can see as many as 15 moves ahead! For most chess players, 5 moves ahead is normal, as you aim for positions from which tactics flow naturally. Book Review: "The Queen of Katwe"
Anna Clark reviews The Queen of Katwe by Tim Crothers.